3 August 2018 (Toronto, ON) – Walt Disney Records is set to release Disney’s Christopher Robin Original Motion Picture digital soundtrack today. The score features music by Emmy® Award-winning Geoff Zanelli (“Into the West”, “Pirates of the Caribbean: Dead Men Tell No Tales”) and Grammy®-nominated composer Jon Brion (“Lady Bird”, “Trainwreck”). Disney’s “Christopher Robin” is in theaters nationwide also today. Disney legend Richard M. Sherman wrote both the music and lyrics for the three new songs which appear the film. The song “Goodbye, Farewell”, which is performed by Winnie the Pooh and friends from the Hundred Acre Wood, can be heard in the opening scene. “Busy Doing Nothing” and “Christopher Robin” are both performed by Richard Sherman himself and appear in the end credits. 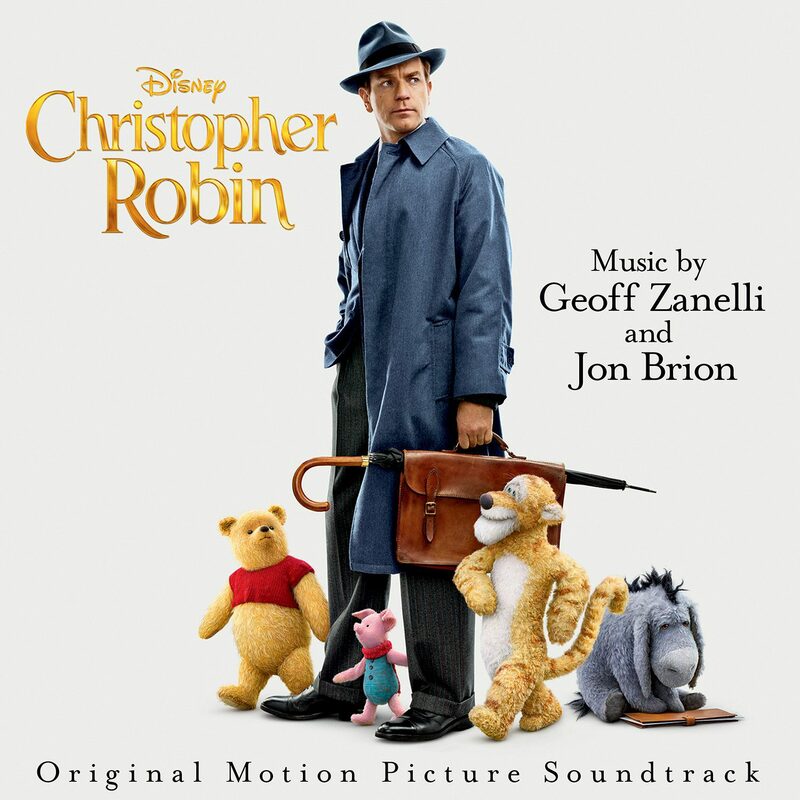 Disney’s Christopher Robin Original Motion Picture Soundtrack is available for download and streaming HERE. In Disney’s heartwarming live-action adventure, the young boy who shared countless adventures with his stuffed animal friends in the Hundred Acre Wood is now grown up, living in midcentury London and dealing with the stresses of adulthood. Now it is up to his childhood friends to venture into our world and help Christopher Robin rediscover the joys of family life, the value of friendship and to appreciate the simple pleasure in life once again. Disney’s “Christopher Robin” is directed by Golden Globe® nominee Marc Forster (“Finding Neverland”) from a screenplay by Alex Ross Perry (“Golden Exits”) and Oscar winner Tom McCarthy (“Spotlight”, “Million Dollar Arm”) and Oscar nominee Allison Schroeder (“Hidden Figures”) and a story by Greg Brooker and Mark Steven Johnson based on characters created by A.A. Milne and E.H. Shepard. The producers are Brigham Taylor and Kristin Burr with Renée Wolfe and Jeremy Johns serving as executive producers. The film stars Golden Globe winner Ewan McGregor (“Fargo”) as Christopher Robin; Golden Globe nominee Hayley Atwell (“Agent Carter”) as his wife Evelyn; Bronte Carmichael as his daughter Madeline; and Emmy winner Mark Gatiss (“Sherlock”) as Giles Winslow, Robin’s boss. The film also features the voices of: Jim Cummings (“Winnie the Pooh”) as Winnie the Pooh and Tigger; three-time Emmy winner Brad Garrett (“Everybody Loves Raymond”) as Eeyore; Golden Globe nominee Toby Jones (“Harry Potter and the Chamber of Secrets”) as Owl; Nick Mohammed (“The Martian”) as Piglet; Oscar winner Peter Capaldi (“Doctor Who”) as Rabbit; and Oscar nominee Sophie Okonedo (“The Secret Life of Bees”) as Kanga.